A teacher at Evansville's Glenwood Leadership Academy leads a lesson for her second graders. The school officially earned its sixth straight F on Friday and could face state intervention as a result. 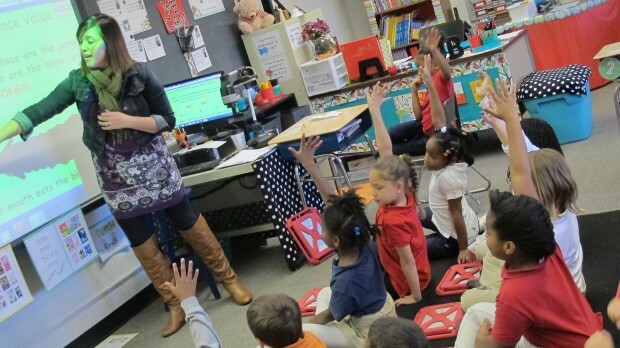 A record number of Indiana public schools earned the top grade on the state’s A-F performance rating scale in 2012-13, state education officials — finally, finally, finally — announced Friday. The State Board of Education’s vote to make the grades official comes after months of political drama and fears of tainted test scores which threatened to delay the release of Indiana’s school letter grades into next calendar year. Search for any traditional public, charter or private school’s 2013 letter grade on our sortable table of results. Private schools still earned A’s at a higher rate than public schools — but that rate has slipped significantly. This year, 51 percent of private schools received the top grade, down more than 30 percentage points since 2011. Indiana schools chief Glenda Ritz pointed out this would be the last time state officials would use the current grading formula to issue the grades. General Assembly members threw it out last session, ordering the State Board to come up with a new model next year. “Though this current model for calculating school accountability grades will be changing, the data does show that some great learning is occurring in our schools, and I want to congratulate our students for their successes,” Ritz said in a written statement released ahead of the meeting. “The new, more transparent and fair model,” she added, “will be fully operational for the 2014-15 school year. Click to enlarge the image of these pie charts, which show the distribution of 2013 A-F letter grades. The leftmost chart includes both traditional public and charter schools. Public school surge. More than 800 public schools received A’s this year — the highest number since the state began rating schools in 2005. Overall, nearly two-thirds of public schools received either an A or a B this year. Private school slippage. Non-public schools haven’t fared as well as public schools under the model state officials have used to calculate A-F grades for the past two years. (Think about that — this model was inaugurated under former state superintendent Tony Bennett, a voucher proponent.) Over that time, more than 100 private schools’ ratings have fallen at least one letter grade while only 18 have increased. The imbalance in those numbers is at least partially because four in five private schools earned A’s two years ago. But the number of private schools earning C’s has also increased six-fold since 2011. The above chart shows the percentage of non-public and public schools, respectively, receiving A's in each grading year dating back to 2005. Christel House received an F. This wouldn’t necessarily be a bullet point of its own if the Indianapolis charter school hadn’t become so central to the controversy surrounding Bennett’s handling of the 2012 A-F grades. (The scandal’s implications are much broader than that school, as we took pains to point out.) But since the AP revealed Bennett’s staff changed the school’s grade from a C to an A last year, a sharp drop in the school’s passing rate on the ISTEP+ this year was enough to lock in the school’s first-ever F.
Drawing from traditional public and charter school data, the above chart shows 49.5 percent of schools' grades remained the same in 2013 as they were in 2012. …at the takeover schools. State officials took over five schools in 2011 — Indianapolis’ Manual, Howe and Arlington high schools and Emma Donnan Middle School; along with Gary’s Roosevelt Career & Technical Academy. In their first full year under new leadership, each of these schools received F’s yet again. So did Indy’s George Washington and John Marshall high schools, which the state could have taken over. 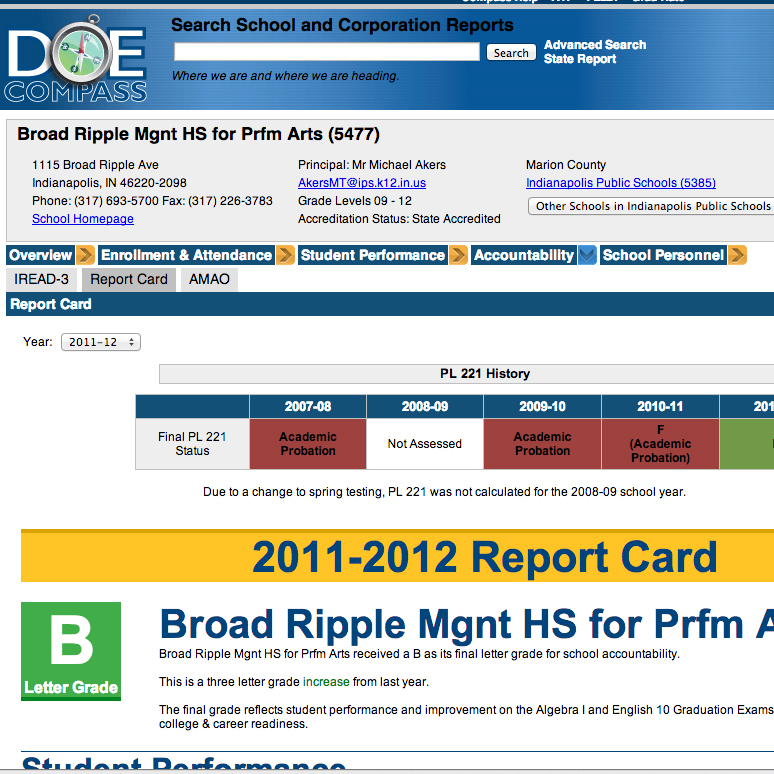 Only Broad Ripple Magnet High School, where the state’s smaller-scale intervention has been in place since 2011, has improved since the intervention. Indiana’s Legislative Services Agency checked the Department of Education’s A-F calculations, state officials confirmed during Friday’s meeting. State Board member Andrea Neal was the only member of the panel to vote against approving the grades, saying she didn’t feel the A-F model reflected the quality indicators parents and educators care about in Indiana schools. “Although it appears complaints around the state are fewer in number this year, there are still schools questioning the transparency of the process,” Neal said.